Every year there is a crowd sourced list of the Top 100 Tools for learning curated by Jane Hart of the Centre for Learning & Performance Technologies (C4LPT), and this week the 2011 list was finalised. 531 learning professionals worldwide submitted their top 10 tools and hence the top 100 list was created. Moodle finished at number 8 with its best showing for the last 5 years where it was 10th, 14th, 9th, 12th and now 8th. Two other Course Management Systems appear further down in the top 100, at 58th and 89th respectively. So one thing that immediately jumped out at me about the list was that there are working integrations with these other tools and Moodle. It is so easy to use YouTube as a source repository for content in Moodle by using the new repository integrations. The repository and portfolio integrations with GoogleDocs makes both teachers and students lives much easier when working with these online tools. Although Moodle could always import an RSS feed in a block, the blogging tool in Moodle can now pull the feed into it as blog posts improving the experience. There is an excellent repository integration available out of the box now for those who want to use the external file management system. 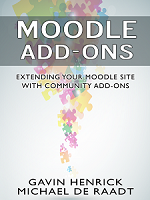 You have long been able to use the embed code from Prezi to embed the presentation into a page in Moodle. You have long been able to use the embed code from Slideshare to embed a slides into a page in Moodle. It is possible to embed the iframe code from Glogster into Moodle. As I mentioned in the presentation in New Zealand Moodlemoot 2011, Moodle has become part of the larger learning ecosystem, where learning and interactions happen lots of places not just in the Course Management System. The availability of integrations between these systems and Moodle helps further strengthens the overall ecosystem with teachers and students being able to use whichever is the best tool and pull the output right into Moodle when appropriate. Be sure to check out the rest of the list and see how many of the tools you use now!